The inaugural Carlsberg Malaysia Chinese New Year Millionaire contest has found its 14 winners who each received RM13,888, and then after a nail-biting event on March 17h, one of them emerged an instant millionaire (before tax). It was Carlsberg Malaysia’s largest cash sum ever to be awarded to a single person. 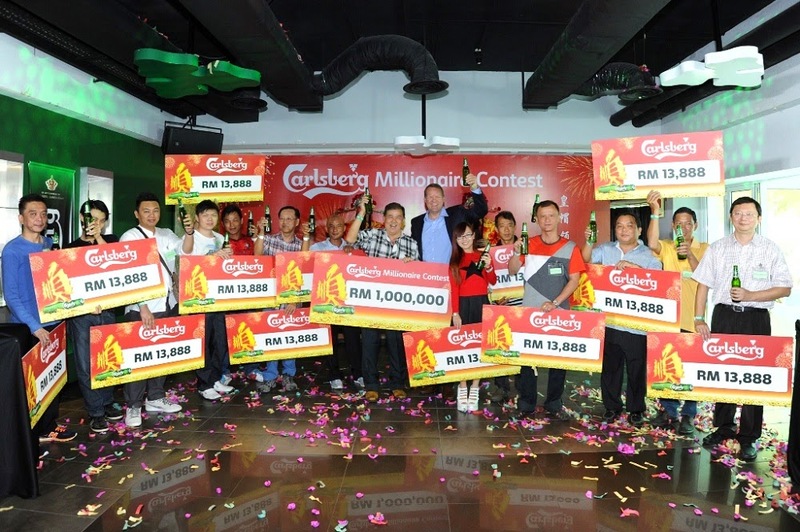 All 14 winners of the RM13,888 had an equal opportunity to be the first ever Carlsberg Millionaire. During the event, they each drew three numbers from an enclosed box and the one with the highest total sum of numbers and correctly answered a final question walked away with the million ringgit, and that very fortunate person was 60-year-old Lim Chong Boon. “I’ve been a loyal supporter of Carlsberg and have been drinking the beer for the past 40 years already. In fact, one of my favourite past times is to have a drink or two with my friends at coffee shops, and it has definitely paid off!” said Uncle Lim. All Lim and the other 13 winners did was purchase Carlsberg, Asashi Super Dry or Royal Stout during the promotion period. Consumers merely had to discover the Chinese character for ‘smooth’ (順) on the underside of the caps of any large bottle, or got the congratulatory message printed on the base of the tray of 24-can Carlsberg Festive Pack.